R. J. Smith was famous for his innovative steam work in Southern California in the 1960’s-‘70’s. He wanted to make steam and so his expertise was in burners and steam generators and particularly in controls. His Green Board is famous for steam analog control design. He had no money and so when people asked him for a steam engine he had few options. Therefore he converted Mercury outboard engines. They were about the right size. They were two cycle and thus converted easily to a bash valve uniflow. 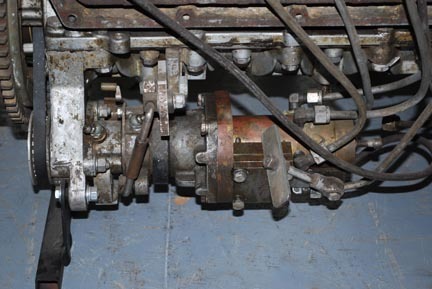 They had huge roller and needle bearings at the big and little ends of the connecting rods respectively. Lubrication was with some toxic mix of the engine cleaner Gunk, some carbon powder, and some heavy oil, all mixed with water to homogenize things. It smelled bad and needed a very large oil-water separator column. This engine is in my collection and has the first of two rotary starter valve designs and ball bearing bash valves. After starting the bash valves took over and the rotary valve became a minor issue. 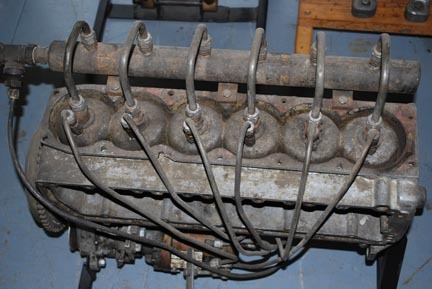 Some of his early designs, as in the four cylinder Mercury I have, are only rotary valve actuated. The 99 c.i.d. Mercury was advertised in his sales brochure as producing 200 nominal hp at 2500 pounds per hour steam. None of the Smith steam systems are still running. He was a very intelligent person and there is a good story there.